When it comes to design, there needs to be a balance between what looks cool and what makes sense. Many designers tend to lose perspective of this and tend to design without any consideration to the requirements of the client, instead, opting for the ‘coolest’ design. But it is just as important to note that what may look cool to one person may not necessarily appeal to another person, while a practical solution to a space will appeal to everyone. The first step in juggling this balancing act is to know your audience. Understand what your client wants and try to find a solution that works for them. And there is no more personal space in the house than the bedroom, because this is where one has to literally ‘live in’ every day. 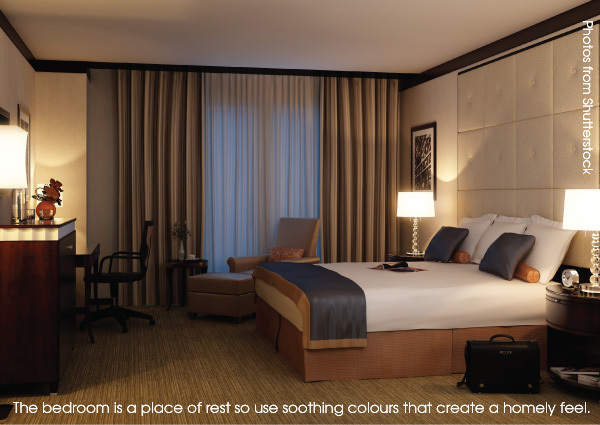 Identify colours and tones that are suitable to the room use, and colour ranges that are acceptable to the user. One of the biggest mistakes is to select a colour scheme that may create the ‘shock effect’ by giving the sense of a sudden surprise, but then renders the space unlivable.Take for example this room where the colour pink has been over-used. Our initial reaction would be the overwhelming effect of the colours. While “cool” in the beginning, this singular colour effect will ultimately dominate the room, making it difficult to accept and to live in on a daily basis. 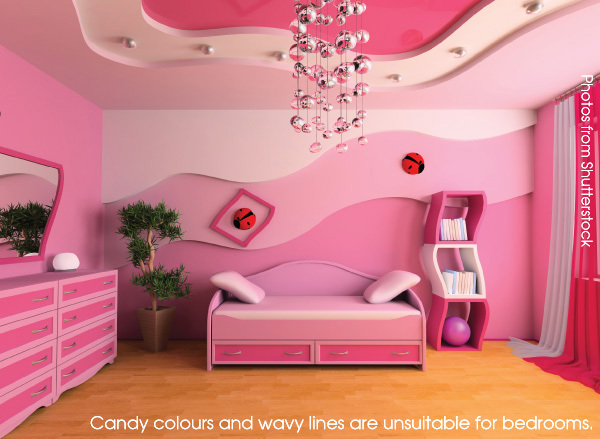 Once the personal paraphernalia goes in, the pinkness stops looking so Barbie-perfect and starts to have a gagging effect.Similarly, another design element to highlight in this example is to avoid the use of wavy lines in the bedroom as these distract from any perceivable line of sight, causing a loss of balance. 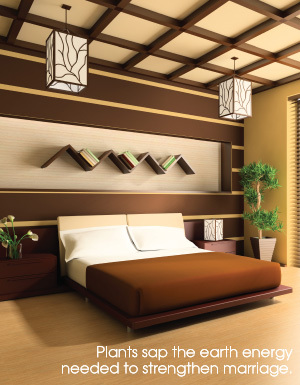 From a feng shui perspective, wavy lines also symbolize the element of water, which is not suitable for use in bedrooms. In this example, there are a few elements to highlight on what not to do. 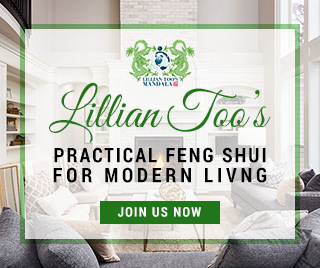 While the design concept is to adopt a more oriental theme with the colours of the space in zen balance, the use of the furniture and the interior accents immediately set off warning bells.First, you should always avoid any sharp or protruding corners. In this case, the zigzag design of the bookcase breaks two major taboos. 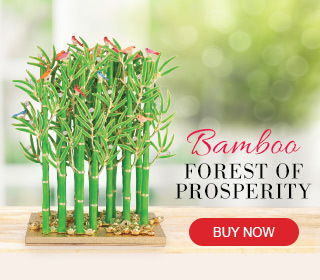 1) You should never have anything above your head when you sleep; and 2) you should never have anything sharp above your head.Second, the use of plants, while they add to the “oriental theme”, has no place in the bedroom.Third, you should always think about the proportions of space. Look at how different design elements affect our perception of a room. In this case, the scale of the bed to the window and ceiling seems rather disproportionate as the space between the ceiling and the window looks ‘tight’ thereby making the window the tallest element in the room. By doing so, it forces the ceiling to be lifted even higher than it is, visually causing the bed to shrink in size and float around the room, and thereby losing the sense of intimacy and solitude which is what is needed for every bedroom.Finally, avoid any eccentric patterns on the ceiling, as this causes a whole array of visual confusion, and forces the ceiling to push itself down onto the room, creating claustrophobia as if being trapped within the space. Everyone loves the attic. Attics are a great sanctuary to find privacy, gather your thoughts and be secluded from the rest of the world. 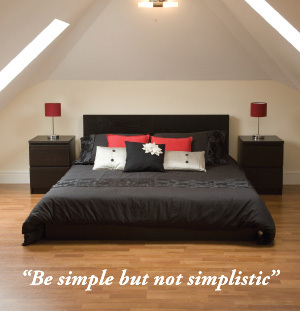 But with attics with limited ceiling space, don’t try to make it your bedroom. In this scenario, the pitched ceiling has inadvertently created a poison arrow straight down the middle as if cutting the bed in half. And due to the limited space, light is brought in through the use of skylights, which then creates further shards as if cutting further into the bed.While the idea of living in the attic is a cool idea, the reality is that if the space doesn’t fit, living in there would create further depressing issues and neglect for the room in the end. Always think of the practical aspects of a room before the accents of the room. When we design a bedroom, it is important to find the balance between all the design elements such as colours, heights, texture and furniture design in order to create the ideal setting. Remember, the bedroom is a place to relax and sleep. Don’t overwhelm the space with elements such as hot colours or ‘ultra modern’ designs. It is better to tone down the visuals to create a more homely feel.In this setting, the use of an earth tone is highlighted through the different elements of the room such as the beige back headboard, carpet, furniture and drapes. This is further balanced with the neutral wall and bed sheet colours, which helps to distribute the colours throughout the room so it does not over-dominate the space.The next design factor is to balance the proportions of the room. By using long drapes, this helps to accentuate the vertical element of the window wall, rather than breaking it up between the window and wall between the ceiling. By doing so, we are able to grab the sense of the space through the bed heights and occasional furniture such as the lamps and paintings, bringing the room to a more human scale of living.When we look at our bedrooms, always take note that what is cool is not necessarily good for you. Always keep the design simple. Don’t introduce any design element that causes your attention to be focused as the key design intent if you want your bedroom to evoke a sense of peace and solitude. The moment we start to introduce these overly ‘cool’ design elements, our attention is too focused, which causes restlessness and agitation.